Club Chairman Ivor Beeks has backtracked on his earlier statement which said that he "has refused to rule out a move to Milton Keynes, following disappointing FA Cup attendances at Adams Park" . Beeks has now told the Bucks Free Press that "It was a flippant throw-away remark which was seized upon. Wycombe will always be in Wycombe". Sanchez's and Beeks' comments following the Wigan cup tie have clearly upset the fans again and will have won few awards in the improved public relations department. The comments have also brought to light again the ongoing desire by the current Board of Directors to change the constitution of the Club or perhaps even scrap the constitution completely and bring in a big money backer. These options were discussed at the Club's AGM back in October and an EGM is likely to be called within the next couple of months. Any such move would require a 75% majority vote from the Club's 500 members. Lawrie Sanchez was in attendance at Adams Park on Wednesday afternoon (24th November) to watch the Wycombe reserve side lose 2-0 to Fulham in the Avon Insurance Combination. Sanchez had left Adams Park the previous night directly after the final whistle of the 4-0 home defeat to Stoke City. Assistant Terry Gibson was left to debrief the team and handle the press conference as rumours spread of the reason behind Sanchez's early departure. The reserve fixture saw a good performance from the Wycombe youngsters although on-loan striker Matt Brady had a quite game on his Wycombe debut. Wycombe went the closest to scoring in the first half when a Ben Townsend crashed off the post after a one-two with Mo Harkin. Fulham went ahead on 53 minutes when Kevin Betsy converted from close range. Danny Bulman saw two chances cleared off the line by Fulham's Mark Hudson before Betsy confirmed victory for the visitors when he fired in from the right edge of the Wycombe penalty area. Wycombe Team: Osborn, Townsend, R Johnson, Leach, P Johnson, Lee, Harkin, Bulman, Senda, Thompson, Brady subs not used Gostick, Williams, Coltman, Simpemba. "I'VE GIVEN UP ON THE CROWD"
Lawrie Sanchez has criticised Wycombe's stay-away fans once again following the perceived 'poor' attendance for Saturday's home FA Cup against Wigan Atheltic. After seeing the gate declared as just under 3,000 Sanchez was quoted in the Bucks Free Press Midweek as saying "This is not a football town. It would be busier if we had a supermarket here. I've given up on the crowd. They generate the money, so they shouldn't come crying at the end of the season when we haven't done as well as they think we should"
"I've got tremendous admiration for the fans that do come but where are the rest? If they don't want a professional football team there's a few towns that do" Club Chairman Ivor Beeks also joined in the debate by adding "If they don't want football here then perhaps we might have to think about something like that" Midweek reporter Dave Peters added that "yesterday (Monday) worried directors held a board meeting to discuss revolutionary ways of pumping money into the Club including a possible relocation to Milton Keynes, and changing the entire fabric of the club by courting a sugar daddy backer." An official Press Release from the Club also stated that Beeks refused to rule out such a move away from Wycombe. These latest outbursts have cause more heated debate between supporters who have seen Wycombe struggle to beat Ryman League Oxford City in the FA Cup and after Tuesday evening's 4-0 home game with Stoke City, were without a League victory for over five weeks. Keith Ryan's late scrambled effort earned Wycombe a deserved draw against Division Two leaders Wigan Athletic in the Second Round of the FA Cup at Adams Park on Saturday. Sean Devine had given Wycombe the lead in the first half before a double strike from Latic's lanky striker Simon Haworth looked to have given the visitors victory. Wycombe will now need victory in their fifth FA Cup game of the season if they are to reach the Third Round Proper for only the sixth time in the Club's history. The replay takes place at The JJB Stadium on Tuesday 30th November - kick-off 7.45pm. The winners of the replay will play Wolves at home in the Third Round due to be played on the weekend of Saturday 11th December. Wycombe beat Wolves earlier in the season in the Worthington Cup. If Wycombe lose the replay they could go through as the 'wildcard' club and be away to John Gregory's Aston Villa. The draw for the First Round of this season's AutoWindscreens Shield took place on Saturday and Wycombe received a bye to the Second Round along with seven other clubs in the Southern Section. Last season Wycombe beat Shrewsbury in the First Round thanks to a golden goal from Jermaine McSporran before losing 4-1 at home to Brentford. The First Round games will be played the week commencing Monday 6th December. 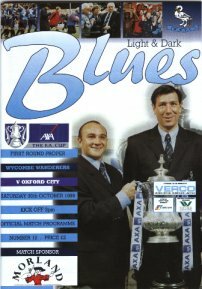 After 300 minutes of trying, Wycombe finally overcame Oxford City by a 1-0 scoreline in the replayed FA Cup First Round tie at The Manor Ground on Tuesday evening (16th November). Despite dominating for most of the game, Wycombe still struggled in front of goal and it was left to a 51st minute strike from Steve Brown to seal the tie. City had a gilt-edged chance to take the lead on the stroke of half-time but Jason Davy must have wished the ground had opened up and swallowed him when he completely miss-kicked with only Taylor to beat. The replayed replay was transferred to Oxford United's ground after an FA Official spun a coin for choice of venue at the FA Headquarters the day after the first replay had been abandoned due to an electrical fire under the away end. Wycombe officials asked for an all round �5 entrance charge for the replay but Oxford City and the FA had the final say and entrance costs were; standing �6 concessions �4, seating �10 concessions �5. Wycombe fans were allocated the open away terrace at The Manor Ground. Jason Cousins missed the replay through suspension while most Wycombe fans were delighted to see the return of Dave Carroll to provide the needed spark in midfield. Keith Ryan also returned having recovered from the leg injury he received in the recent game at Oldham. The victory set up a home encounter with Wigan Athletic in Round Two. Read the COTN match reports from all three games against Oxford.. While the First Team were battling it out against Oxford City in the FA Cup, Wycombe Wanderers Youth Team were progressing to the Third Round of the FA Youth Cup after they overcame Southend United in a replay at Roots Hall. Like the first game at Adams Park, the game ended 2-2 but Wycombe went through 4-2 on penalties - Wycombe 'keeper Steve Williams saving twice. Wycombe had been pegged back in the final minute of normal time after Peter Holsgrove and Ian Simpemba had scored for The Wanderers. Wycombe will now travel to St.Andrews to play Birmingham City in the Third Round on Tuesday 7th December - kick-off 7.00pm. The scheduled Wycombe v Southend FA Youth Cup game at Adams Park on Wednesday evening (10th November) went ahead as planned after the Club carried out stringent safety checks on the floodlight switchgear that caused the fire alert on Tuesday evening. The ended in a 2-2 draw after Leeyon Phelon popped up to grab an equaliser with 10 minutes left in the clock. Phelon had opened the scoring on 14 minutes when an exquisite chip beat the United 'keeper from 20 yards. The visitors drew level on 26 minutes after Wycombe 'keeper Steve Williams was caught out by the bounce and Tony Boot scrambled the ball home. Boot then scored again five minutes before the break to give United a 2-1 lead. Johnny Dixon and Lewis Cook were introduced after the interval and Ryan Gostick had a good opening on 63 minutes to even the scores. Three minutes later Williams made up for his earlier error to save well. Phelan's equaliser came after a ball in from the left side of midfield and was just reward for a very youthful side. The replay will take place at Roots Hall at 7pm on Tuesday 16th November. The winners have been drawn away to Birmingham City in round three. The FA Cup replay with Oxford City at Adams Park on Tuesday evening ended in mass confusion when the tie was abandoned after 120 minutes having finished 1-1 after extra-time. City had won the toss for choice of ends for the penalty shoot-out and Steve Brown was just preparing to take the first spot kick when alarm bells could be heard coming from the away stand. An announcement was made that spectators had to leave The Hillbottom Road End stand due to "unforeseen circumstances" Further announcements followed by safety officials asking for all spectators to leave the ground and that no further play would be possible. Fans were left in confusion outside the ground as details of the conclusion to the tie were sought. It was later reported that a small electrical fire under the away end had prompted the action as fans from both clubs were mystified with events. Two Fire Appliances made there way to Adams Park to deal with the situation and thankfully there were no casualties or serious problems to report. Oxford Chairman Mick Woodley spoke to Radio Five Live shortly after the game and said he was "very very unhappy". With the FA ruling that the game must now be replayed, Woodley hinted that every effort would now be made to play the game in Oxford if at all possible. 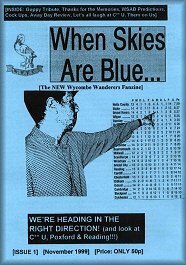 The trend for new Wycombe fanzines continued last Saturday with the arrival of a new fanzine When Skies Are Blue. Filling in the gap left by Tales of a Chairboy, the first issue of WSAB is an enthusiastic effort edited by Ian Baker of the Tales from the Valley End website - now re-titled to When Skies Are Blue. The 20 page issue sells for 50p and will be available near the entrance to Adams Park prior to home games. The midweek Division Two game at Oldham started and ended in dramatic fashion. Wycombe led within the first two minutes, let in an equaliser after three minutes and then saw Jason Cousins sent off for a 'professional foul'. Martin Taylor then kept Wycombe in the game with a string of unbelievable saves before Wycombe looked to have snatched a winner in the final minute. Then to complete a bizarre evening, Oldham were allowed to score almost straight from kick-off to make the final score 2-2. The draw for the Berks and Bucks Senior Cup has been made and will see the visit of Chesham United on Wednesday 5th January 2000. Matthew Brady, who played for Wycombe reserves in a recent Avon Insurance Combination game, has joined Wycombe on a month's loan. The left sided attacker is currently playing at Ryman League Boreham Wood but was previously at Barnet where he played alongside Sean Devine at the same time that Terry Gibson was at Underhill. The Quiz Night organised by the Wycombe Wanderers Independent Supporters Club raised �250 to be donated to the Youth Team. Eighteen teams took part in the event held on Wednesday 20th October at the Trades and Social Club as was a "tremendous success" according the WWISC Chairman Ted Wheller. A cheque was presented to Youth Team Manager Gary Goodchild on the pitch at half-time during the FA Cup game with Oxford City. This Official Supporters Association also organised a Quiz Night which took place on Thursday 4th November in the Keen Lounge at Adams Park. Again the night was a great success with profits again going to assist the Football Club. The Football Club assisted both quizzes by donating major raffle prizes inlcuding the use of an Executive Box for a forthcoming game for 12 people.